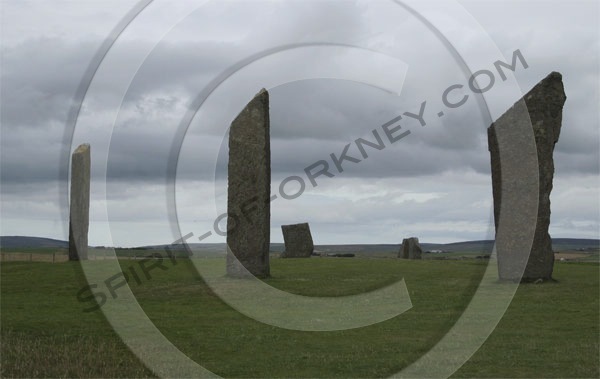 The imposing neolithic standing stones of Stenness in Orkney are thought to have been erected between 3000 and 2500 BC. Twelve standing stones originally formed the stone circle at Stenness but only four remain today, the tallest of which is over 5.5 metres high. The Stenness stone circle in Orkney’s west mainland was surrounded by a ditch 6 m wide and 2.3m deep and outside of this, a similar bank. Archaeologists refer to this type of structure as a “henge“. The ditches and banks have been eroded by ploughing activity and are no longer visible. During excavations, features discovered in the centre of the ring suggested that a wooden post was situated centrally, later followed by a 2m square setting of stone slabs with 2 larger stones set to the north. The three large slab structure to the north, has been rebuilt twice over the years and is comparable to structures in other great stone circles. All of the features lie on a line due north from the centre. In 1906AD, a fallen stone was re-erected taking only 8 men and a timber framework ramp, leading to calculations that it took over 5000 man days to build Stenness, with most of this time spent digging the ditches and building the bank. 50 men could have built the henge over a single summer or 10 – 20 men over a few seasons. Archaeologists discovered “grooved ware” pottery, bones of animals and one human finger along with evidence of a fire in the small central setting. Signs of much later iron age activity was also noted, showing that the henge stayed in use for many years following it’s build. Stonehenge – Probably the best known prehistoric stone circle. Stone Circles .org – List of British Prehistoric sites and stone circles.